This photo from Sept. 6, 1943 shows the aftermath of a train derailment at Frankford Junction in Philadelphia. Seventy-nine people were killed and more than 100 injured. Frankford Junction, the scene of Tuesday night’s deadly Philadelphia derailment of Amtrak Regional 188, has seen devastation before. On Labor Day, 71 years ago, the Congressional Limited careened off the tracks with 541 passengers on board including many service members on leave. Seventy-nine passengers were killed and 117 were injured in one of the worst rail disasters of its day. The new high-speed electric train was traveling the same route on Sept. 6, 1943 as Amtrak 188 — Washington D.C. to New York. It was packed with passengers, and an extra, older dining car was added to deal with the capacity, according to the National Railway Historical Society's Lancaster Chapter. The addition brought the car total to 16. 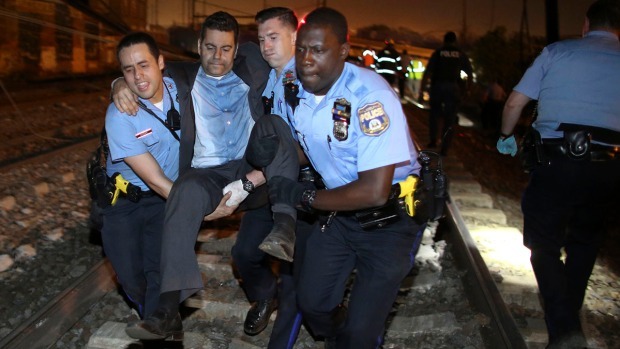 The ride had been smooth, reports said, until it passed North Philadelphia station at Broad Street. A part of the wheels, the journal box, on that older car began to overheat and spark. Then, right before the curve, the axle fell off and derailed eight cars. The dining car, carrying 50 people, went careening into a steel gantry and sliced clear through killing many in the car. Some passengers were thrown from windows while others were trapped inside cars. "The crash, my God, it was awful,” she told the paper. “It was a sad day."